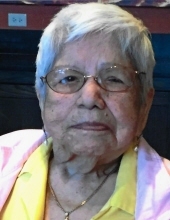 BARBARA O. ROJO, (nee Olvera); beloved wife of the late Carlos Rojo; devoted mother of Carlos Jr. (Lynette), Victor (Stella), Richard, Robert (Rosario) and the late Alexander Rojo; dearest grandmother of 17; great grandmother of 15; great great grandmother of 6; devoted daughter of the late Cecilia and late Victor Olvera; dear sister of the late Carmen; fond aunt and great aunt of many nieces and nephews; also survived by a very large extended family. To send flowers or a remembrance gift to the family of Barbara O. Rojo, please visit our Tribute Store. "Email Address" would like to share the life celebration of Barbara O. Rojo. Click on the "link" to go to share a favorite memory or leave a condolence message for the family.